Trench results with assays up to 145g/t of gold confirm the existence of a continuous zone of shallow high-grade narrow vein gold mineralisation. The systematic sampling within this zone displays remarkable continuity along the entire 33 metre strike of the exposed vein and structure. This follows recent results from 157 rock chips samples collected from out cropping and sub cropping veins where 57.9% of samples graded more than 1g/t gold. A total of 56 samples returned grades higher than 10g/t gold and 8 samples returned more than 100g/t gold. Geophysics indicates the prospective area of mineralisation is 4.5 kilometres long and 300 metres wide. Further geologic work, including a drilling program, is planned once assay results have been evaluated. The project is strategically located within the South Gobi Copper Belt, which hosts the world class Oyu Tolgoi copper-gold project, and 260 kilometres east of Xanadu’s flagship Kharmagtai copper-gold project. Oyut Ulaan comprises a large and underexplored porphyry district covering 40 square kilometres, and consists of multiple co-genetic porphyry copper-gold centres, mineralised tourmaline breccia pipes and copper-gold/base metal magnetite skarns. Xanadu will continue its systematic, low cost exploration at Oyut Ulaan with further reconnaissance exploration, field mapping, trenching and infill sampling ongoing. Trenching and detailed channel sampling of other parallel structures at Stockwork I and Bavuu Zone within 1.5 kilometres is now complete and results are expected in coming weeks, before drilling is planned. Copper grades within the samples from the Stockwork II zone average 0.3% which supports the possibility of a buried porphyry copper mineralisation. The zonation seen world-wide for this association includes upwards transitions from copper-gold porphyry veins to shallow level gold systems. Xanadu is trading around $0.21 giving it a market cap of $93 million, which is also double where it started the year at $0.11. The stock continues to attract broker attention from Bell Potter, who lifted their target price in February to $0.35 while maintaining their Speculative Buy rating. 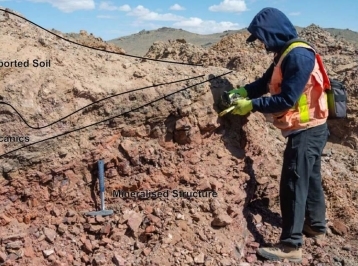 While Xanadu’s flagship project remains to be the more advanced Kharmagtai, the exploration upside that Oyut Ulaan offers is compelling given the continued high grade and bonanza trenching results.